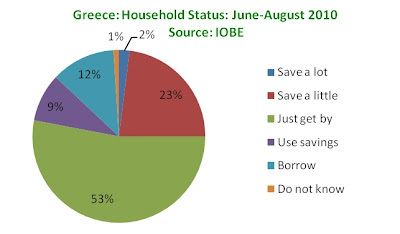 Greek Default Watch: How Are Greek Households Coping? The graph below, from IOBE's latest report on the Greek economy (here, but for now only Greek), tells a very interesting story on how households are coping with the recession. It is based on a survey conducted between June and August 2010 and it groups households in three categories: those that are saving, those are that are just getting by and those that are drawing from savings or borrowing. About 25% of households fall into the savings category, although the bulk (23%) are in the "saving a little" rather than in the "saving a lot" (2%) group. More than half (53%) consider themselves as barely getting by - neither being able to save but not needing to draw from savings either. 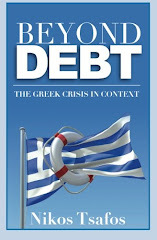 The balance is split between those who are drawing from savings (9%) and those who are incurring new debt (12%). There is also a small share (1%) of "I do now know" answers. The data series does not go too far back, but it is interesting to compare with the Q2 IOBE report which showed the same graph covering the period from January to November 2009. Then, the share of the "just getting by" category was 59%. So there is a six percentage point reduction between then and the summer of 2010. Half of those percentage points went up to the category of saving a little and half went down (1 point to savings withdrawal and another 2 to debt). So the impressions one gets reading these graphs are: (a) only a small portion of Greek households are able to put aside any money and in fact almost a fifth of households are either depleting their savings or borrowing to survive; (b) relative to 2009, there was an equal shift of the "barely getting by" households towards better as well as worse; and (c) that as savings and assets keep getting depleted, inflation continues and unemployment rises, there is a very large portion of the Greek population that risks moving to debt to finance current spending.